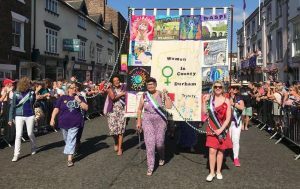 The historic home of the Durham miners hosts a special International Women’s Day celebration, featuring the premiere of a new film about the Women’s Banner Group. The event at Redhills: Durham Miners Hall will include the first chance to see Of Whole Heart Cometh Hope. The new documentary by Amber Films tells the story of the Women’s Banner Group (WBG), created to celebrate the achievements of women. The screening will be held in the magnificent Pitman’s Parliament at Redhills, the home of the Durham Miners’ Association (DMA). The DMA recently launched The Redhills Appeal to renew its historic home as a centre for education, culture, and heritage. The evening will also include a Q&A with filmmakers and members of the WBG, guest speakers and a licensed bar. The event is free, but donations would be welcome. Any money raised will be divided equally between the Women’s Banner Group and The Redhills Appeal.